Even though I was born in the U.S. I wasn’t raised on a traditional American diet. As a result, I’m not fond of many popular foods. Velveeta, although not really a food, comes to mind. As does Miracle Whip. A few salads I also find unpalatable. Like the over-mayonnaised macaroni salad, salads with poppyseed dressing, and any salad with jello. Pasta salads should be lovely, flavorful, not drowning in any kind of dressing, and definitely not sugary. One day this pasta recipe caught my attention. If you’ve never discovered the blog The Vintage Mixer, you need to hop over there. Becky is a beautiful young woman, cook, traveler, adventurer, living in Utah. She has even written a cookbook. Her pasta salad contains roasted mushrooms, a definite improvement over raw mushrooms! The pasta in this salad if pesto-filled tortellini, and who doesn’t love tortellini?!! Also included are fresh arugula leaves, plus a simple lemon dressing. Simple but brilliant. Because it is wintertime, I served this salad warm, with the warm tortellini and roasted mushrooms, and the arugula slightly wilted from the dressing. Preheat oven to 400 degrees. Toss mushrooms in olive oil, 1/2 teaspoon salt and fresh thyme. Spread out onto a baking sheet in a single layer and roast for 15 minutes. While mushrooms are roasting, bring a large pot of salted water to a boil. Once boiling, add the tortellini and cook according to package directions. 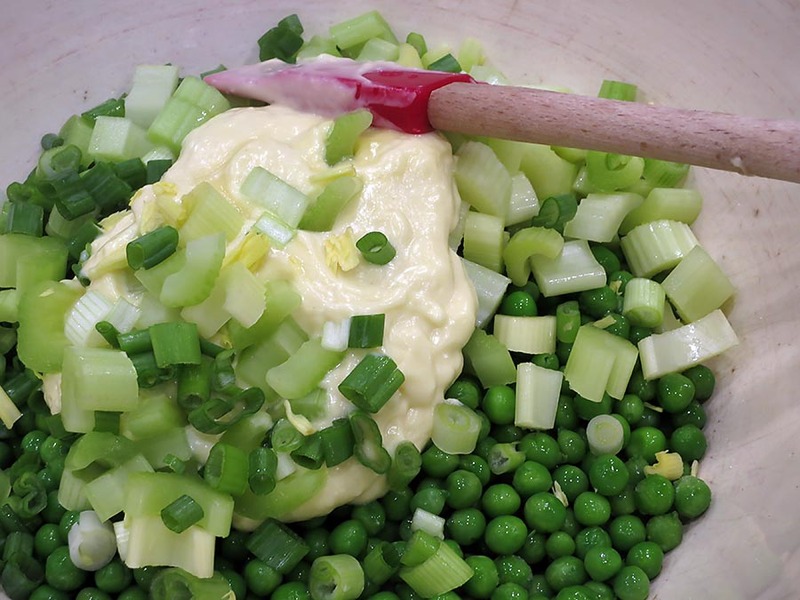 Whisk together all of the ingredients for the lemon dressing and set aside. Once mushrooms are done remove from oven and set aside. Drain tortellini and toss with a little oil. Once tortellini has cooled slightly, toss with the arugula and lemon dressing. Let the arugula warm and “wilt” for a few minutes, then stir in the mushrooms and Parmesan gently. As you can tell, I also sprinkled on some pomegranate seeds and microgreens over the salad for the sake of festivity! note: After visiting 4 stores, I had to finally settle on cheese tortellini. Maybe I have to go to Utah for Becky’s pesto-filled tortellini! I am an American. Born and raised. But I’ve never been a big fan of American food. I just wasn’t raised on it. In fact, I can remember the times that I was subjected to traditional American dishes after I left home, like beanie weenies, jello salad, sweet potatoes with marshmallows, and poppy seed dressing. Vividly. The list is actually very long, I just don’t want to make anyone feel defensive about the kind of food on which he/she was possibly raised. I was just raised differently. That’s why I wrote the post entitled On Being a Food Snob. For meals we enjoyed fish in fermented black bean sauce, coulibiac, duck a l’orange, and soufflés. For years my birthday meal request was brains in a cream sauce, served in puff pastry cups. When I had chicken pox, my mother made me Chinese chicken lollipops and crème caramel. She was raised in France, knew no other way to manage meals. She shopped often, chose what was in season, and made everything from scratch. And as you can tell, she really embraced global cuisines as well. So I truly come by my food snobbiness naturally. Years ago I left behind a friend in California when I moved to the Midwest after getting married. I’ve only visited her once in 32 years, which is quite sad. Way back then she had a young family that I adored, and I was often invited for dinner. Spaghetti was a big involved meal for her, even though she bought the sauce in a jar, the Parmesan in the green carton, and the garlic bread in a foil wrapper. But it was fine. I loved being at her beautiful house with her family, which was way more important than the food on the table. And besides, she always served drinks. Jeanne actually inspired me a lot, although I didn’t really realize it back then. I was quite young, ten years younger than her, and had no immediate plans on marrying and having children. Plus I was quite happy being a professional. But she was a wonderful mother and unconsciously I learned from her. Just not from her cooking. Oh, and she was the one who bought me my first fast food burger! One day, however, she served a salad called crunchy pea salad. She had gotten the recipe out of one of her Junior League cookbooks*. I am not going to say anything about those cookbooks, with plastic bindings and recipes like Aunt Susan’s Favorite Cake and Velveeta Rotel Dip. I’ve probably already lost followers from my anti-American food comments. But this salad was great! And really unique!!! And to this day I’ve kept the recipe, and have actually made it a few times. I’ve never heard of it elsewhere, or seen it on a blog, but I suspect it’s fairly well known considering the source. The ingredients are wonderful. Peas, bacon, cashews, and sour cream, which all go together beautifully. 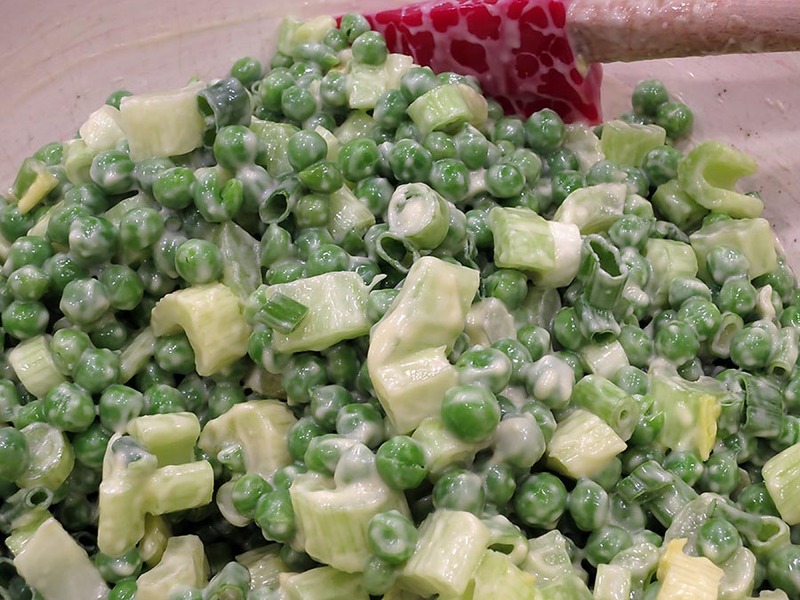 It’s a great room temperature salad to serve at a picnic, or garden buffet, or even a brunch. So thank you Jeanne for this recipe. And it’s a good reminder to stay in touch with old friends, and those who have moved away. 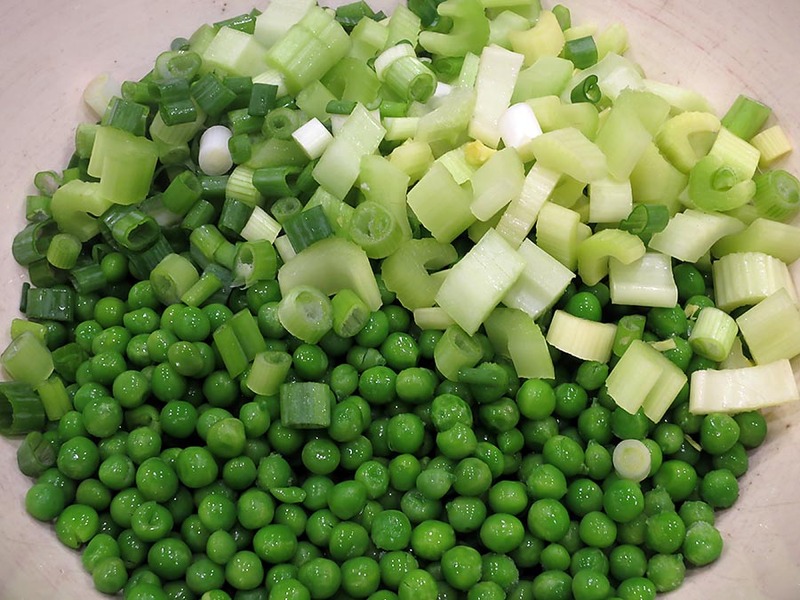 Place the thawed peas over paper towels in a bowl and set aside. Crisply fry the bacon bits and drain well on paper towels; set aside to cool. Have your celery and green onions prepared and ready. I’d honor the 1/4 cup of green onions. This salad is mild, and you don’t want it too oniony, especially if you have strong-flavored green onions. Since I didn’t have roasted and salted cashews, I actually roasted mine with some salt in the leftover bacon grease. I must say, they almost disappeared before I could put the salad together. Blend everything together well. This recipe makes more than you need for the salad, so keep the leftover vinaigrette in a jar and refrigerate. I blended about half of the sour cream along with the 1/3 cup vinaigrette for the salad, just to make it incorporate better. The vinaigrette and all of the sour cream could be whisked all together in the bowl before adding the other ingredients, as well. To assemble the salad, remove the paper towels from the bowl with the peas. Add the celery and green onions. Add the remainder of the sour cream, if you haven’t already. Gently stir to mix well. Taste for seasoning; I added at least one teaspoon of salt. Normally, the bacon and the cashews would be included in the salad, but for the sake of photography, I sprinkled them both on top. This is what the salad is supposed to look like. Not really as pretty, although equally delicious! Don’t be shy about the amount of sour cream in this recipe. It adds creaminess, of course, but also a wonderful tang. note: If you can, add the cashews at the last minute. If you have leftover crunchy pea salad that contains cashews, they will soften, and nothing will really be crunchy in the salad. * Before you even think about writing a comment defending Junior League cookbooks of America, please know that I’ve actually been featured in one, and I’m very proud of that fact. 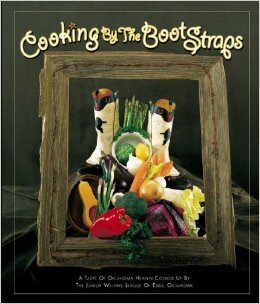 Over the years, the cookbooks have really evolved, and now have normal bindings, gorgeous photos, and creative recipes. Below is a blurb from a write-up about me, in Cooking by the Boot Straps, published in the town where I live. I am not Martha Stewart. Nor do I want to be. Because people would hate me. I really like having friends who like me, and I especially like having daughters who aren’t doing a TV show making fun of me. So I’m totally okay with not being a wannabe Martha Stewart. She’s been in the news lately because of her hateful comments towards bloggers – regarding our non-professionalism in the kitchen – even though it doesn’t seem that Ms. Stewart herself attended cooking school of any kind. So that’s a bit hypocritical of her. Many of us are self-taught, including you, Ms. Stewart. And, let’s face a major biographical fact – this woman has been to prison. I haven’t. But with all that being said, Ms. Stewart must be revered to some extent, at least I feel this way, for the fact that she really has good taste. She has fabulous resources, of course we would all as well if we were zillionaires, and is extremely creative and crafty. I’m not sure if Ms. Stewart herself coined the term “tablescape,” however it’s become a commonplace appellation for the design of the party table. And if you look at her magazines or her entertaining books, Ms. Stewart is very talented at designing tablescapes. Or maybe her people are. I’m not sure. I’m really envious of anyone who is creative in this way. Just look at Pinterest and you’ll know what I mean, just in case you’re one of the millions who hasn’t looked at Pinterest. So I had a Christmas party a few days before Christmas in 2013. Normally I would have put clipped poinsettias and placed them in three or five vases along the middle of the buffet table and called it done. I probably would have used a green tablecloth, because that’s festive. My dining room is painted red, so the red and green would make things really festive, right? You can tell by my blog that I love colors, but I especially love red and green. This photo comes from this blog. 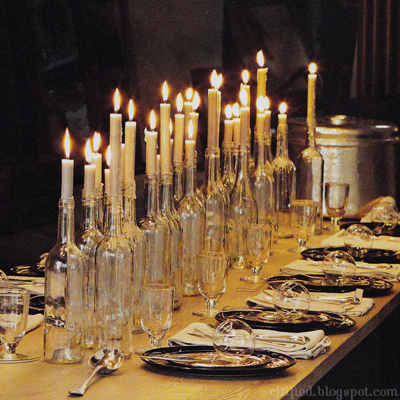 The photo was from a wedding sit-down dinner; the white candles really add the wedding “feel” of the celebration. Beautiful. So many years ago, because of this photographic inspiration, I forced myself to drink 13 bottles of Clean Slate Riesling, because I thought the bottles would be perfect for a buffet table. I didn’t know when I’d use them, I just knew I would…some day. They’re fairly clear bottles – not aqua, and not dark green. Then I removed the labels, washed the bottles, and stored them in our basement. Until recently. I decided to use the wine bottle-candle idea for my Christmas party! I really got excited, because for once I wanted to try my hand at a creative tablescape. Something beyond red and green. I decided to go the non-color route, and started gathering goodies. More in natural tones, and a lot about nature. And then, it all just fell into place. I found these beautiful carved wooden birds at my local florist shop. I purchased the dried clove-studded oranges and lemons, and included some pinecones my husband scavenged on a walk with the dogs. I then found some faux cherries, added faux walnuts, and threw in some raw cranberries for a little more color, at the last minute, of course. Right after the food was placed on the table, my husband lit the candles, and it all came to life. This may not be your style, but I am very proud of myself for getting out of my comfort zone a bit and trying my hand at holiday creativity. I was very pleased at the subdued, natural look of the goodies strewn along the center of the table, and candle light just can’t be beat.